Book Review: Occupy until I Come: A. T. Pierson and the Evangelization of the World. 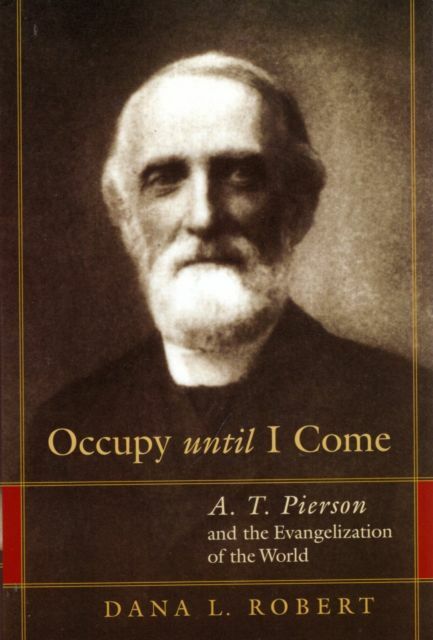 Occupy until I Come: A. T. Pierson and the Evangelization of the World. by Dana L. Robert, Grand Rapids, Mich. : W.B. Eerdmans Pub., c2003. A Library of Religious Biography Series. I’m reading a diverse number of biographies at present ranging from literary, historical, through to biography of the arts and group biographies. I am particularly interested in those biographies that tell of faith and how it contributed both to the biographee’s life and to society. As I searched Hewitson Library catalogue for biographies of people of faith for my project, I discovered Dana Robert’s biography of Arthur T. Pierson (1834-1911). I became aware of Dr. Dana Robert’s research when I first started exploring a topic for a Masters on women in mission way back in the early 1990s. Her numerous journal articles and finally her book American Women in Mission: A Social History of Their Thought and Practice, (Macon, GA: Mercer University Press, 1997) updated a gap that appeared missing in mission literature at the time. Dana Robert has undertaken that task again in her biography of Rev. Arthur T. Pierson by bringing to our attention a hugely significant personality in the world of foreign missions in the last three decades of the nineteenth century. References to Arthur T. Pierson’s writing are splattered throughout the early NZ Presbyterian Mission records as the Foreign Missions Committee developed strategies for missionary expansion into South China and North India during the first decades of the twentieth century. His many writings on mission were resources used in devotional material and missions’ studies by Bible Classes and Presbyterian Women’s Mission Union for a number of years. So I found it illuminating to follow his complex life and journey of faith. I was keen to discover how Dana Robert dealt with Pierson’s religious faith and its interconnection with his surrounding society and the culture in which he lived. Often historians, particularly New Zealand historians, have difficulty mapping the role of religion and faith and its response to society and global society. Did Dana Robert interweave Pierson’s theology and faith and draw out his response to his daily life, within his family and his ministry, within the dramatic cultural changes in American society that occurred during his life? I was not disappointed. Dana Robert takes us on an engaging journey as we follow his Presbyterian Calvinist traditionalism forward to a late nineteenth century American fundamentalist, pietistic and premillennial theology and faith during a somewhat tumultuous period of America’s history. Pierson’s first experience of religious emotionalism was as a young lad at a Methodist Revival meeting, which led onto his ‘baptism of the Holy Spirit’ during his ministry training at the Union Theological College in New York in 1858. His efforts to reconcile science and the Bible while in his first parish almost caused him to loose his faith as he worked through days of depression. Despite the heavy criticism he received a few years later, Pierson justified the Civil War as a ‘sacred mission’ on the grounds that the Puritan fathers brought the gospel as a lighthouse to the land. An end to slavery was ‘God’s battle’ and the sacrifice of life was a positive for the evangelisation of America. His later highly successful ministry in the large elite parish of Fort Street, Detroit, during the 1870s, resulted in a further ‘crisis of faith’. Although he was a dynamic preacher, influenced the post-civil war evangelical identity, reshaped Michigan Presbyterianism, and helped develop its foreign mission programme, his inability to reach the urban poor with his literary style of ministry finally caused his ‘biblical conscience [to] leave him guilt ridden’. After a year of struggling with his ‘spiritual level of consecration’ he made the move towards a highly successful evangelistic ministry. Two parishes further on opportunities opened to bring his missionary zeal to the centre of his and others’ ministries. Dana Robert skilfully sets the rise of America’s urban problems, the increased immigration and growing poverty as a further motivation for a world mission; only ‘the gospel of Jesus Christ would change hearts and alleviate social problems’, he believed. He set about developing programmes to mobilise and support faith missions across the western world. He is reputed to be the one behind the Student Volunteer Movement’s watchword, ‘the evangelisation of the World in this generation’, led by the well-known John Mott. His writings were prolific during this period. He edited the interdenominational magazine the Missionary Review of the World from 1888 until his death in 1911, and spoke at hundreds of gatherings on both sides of the Atlantic. Dana Robert draws out Pierson’s desire and urgency to maintain unity within Christendom, in particular a transatlantic evangelicalism.Pierson believed the effort of bringing the world to Christ would usher in Christ’s return. I am intrigued by his continuing relationship with the US Presbyterian Church and its difficulty in accepting his re-baptism in the late 1890s, which, for them, was a step too far. I admire Pierson’s wife, Frances and their seven children. Dana Robert has given them a well-balanced place in Pierson’s over-all story. Without their committed support for his ministry through his quite tumultuous and factious times, living within a limited income during his mission phase, and coping with following him from place to place and back and forth across the Atlantic, would he have achieved what he did? I thoroughly enjoyed this biography. Dana Robert’s choice of title based on the story of the talents in Luke is excellent, reflecting as it does Pierson’s goal as he strove to keep ‘God’s business productive’.